There are many ways that a lubricant could fail to deliver fuel-efficient engine performance. Many of these are due to formulation issues as opposed to transient properties of the lubricant in service. For instance, there were significant advances in energy conservation when switching from GF-2 to GF-3 (international quality designation for gasoline engine lubricants) in 2001 (Figure 1). When a lubricant degrades, it forms reaction products that become insoluble and corrosive. So too, the original properties of lubricity and dispersancy can become impaired as the lubricant ages and additives deplete. Much has been published about the risks associated with overextended oil drains and the buildup of carbon insolubles from combustion blow-by. High soot load of crankcase lubricants has been reported to impair the performance of ZDDP antiwear additives. Some researchers believe that soot and dust particles exhibit polar absorbencies, and as such, can tie-up the AW additive and diminish its ability to control friction in boundary contacts (cam nose, ring/ liner, etc.). Sooner or later, wear from abrasive particles and deposits from carbon and oxide insolubles will interfere with efficient combustion in an engine. Valve train wear (cams, valve guides, etc.) can impact timing and valve movement. Wear of rings, pistons and liners influences volumetric compression efficiency and combustion blow-by resulting in power loss. It has been documented that there is an extremely high level of sensitivity at the ring-to-cylinder zone of the engine to both oil- and air-borne contaminants. Hence, abrasive wear of the ring/cylinder area of the engine translates directly to increased friction, blow-by, compression losses and reduced fuel economy. Wear particles contribute to oxidative thickening of aged oil. 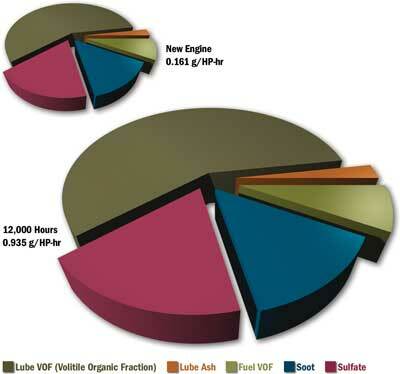 High soot load and/or lack of soot dispersancy can also have a large impact on oil viscosity increases. Viscosity-related internal fluid friction not only increases fuel consumption but also generates more heat that can lead to premature degradation of additives and base oil oxidation. Stiction Losses. Deposits in the combustion chamber and valve area can lead to restriction movements in rings and valve control. When hard particle contamination agglomerates with soot and sludge to form adherent deposits between valves and guides, a tenacious interference, called stiction, results. Stiction causes power loss. A bus engine fuel consumption study by G. Andrews, et al. of the University of Leeds (Table 1), provides evidence of the benefit associated with cleaner oil on fuel economy in an actual road trial.4 It was noted that the Cummins engine’s fuel efficiency increased 2 percent to 3 percent when a six-micron by-pass filter was used along with a full flow filter. The study spanned 50,000 miles of service. The fuel consumption was calculated based on detailed fuelling records from the fleet. In a similar study reported by the same authors using by-pass filtration, a 5 percent to 8 percent reduction in fuel consumption was achieved on a 1.8 liter Ford passenger car IDI diesel engine. When the engine consumes oil, due primarily to contaminant-induced wear, oil enters the combustion chamber, burns with the fuel, and is pushed out with exhaust gases as particles and volatile hydrocarbons. New mineral-based lubricants have a more volatile light-end fraction and are more prone to hydrocarbon emissions. The level of exhaust emissions increases considerably over time corresponding to engine wear and deposit formation in the combustion zone. This leads not only to greater concentration of exhaust particulates, but also to a higher percentage that are unburned hydrocarbon, a by-product of oil consumption. Good environmental stewardship is everyone’s responsibility. We all benefit from cleaner air and a safer environment. In addition, the financial impact that comes from reduced fuel consumption alone can be substantial. Perhaps it’s time for OEMs and users alike to begin revisiting contamination control practices, including filtration, associated with internal combustion engines. If clean oil is important to control wear, reduce fuel consumption and emissions, perhaps it’s also time for users to begin asking their laboratories to begin reporting particle counts and ISO Codes of used crankcase oils. Remember, if it’s important, we measure it - correctly. What gets measured gets done. Staley, D.R. (1988). 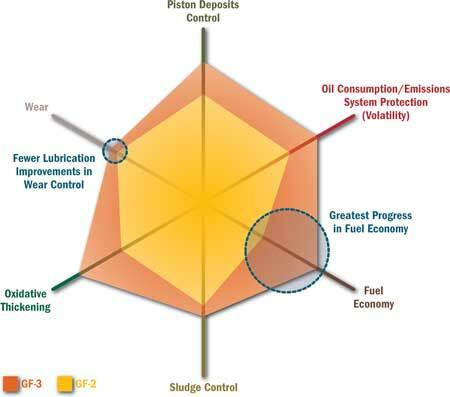 "Correlating Lube Oil Filtration Efficiencies with Engine Wear". SAE Truck and Bus Meeting and Exposition (Paper 881825). Madhavan, P.V. and Needelman, W.M. (1988). "Review of Lubricant Contamination and Diesel Engine Wear". SAE Truck and Bus Meeting and Exposition (Paper 881827). McGeehan, J. (2001, September-October). Uncovering the Problems with Extended Oil Drains. Machinery Lubrication magazine (www.machinerylubrication.com), pp. 24-29. Andrews, G.E., Li, H., Jones, M.H., Hall, J. Rahman, A.A. and Saydali, S. (2000). "The Influence of an Oil Recycler on Lubricating Oil Quality with Oil Age for a Bus Using In-Service Testing". SAE 2000 World Congress (Paper 2000-01-0234). Foder, J. and Ling, F.F. (1985, October). Friction Reduction in an IC Engine through Improved Filtration and a New Lubricant Additive. "Lubrication Engineering". pp. 614-618. Barris, M.A. (1995). "Total Filtration: The Influence of Filter Selection on Engine Wear, Emissions and Performance". SAE Fuels and Lubricants (Paper 952557).